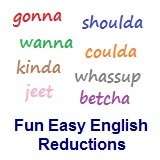 ﻿ Fun Easy English - new-american-english-reductions-reduced-words-topic-what-is-word-what-is-her-whatser. In this lesson you will learn the American English reduction whatser. This American English reduction is used often when asking information about a woman. Reductions, such as whatser are not real words in English.